Remedy is known for linear action games with quirky stories. They’re the studio that created Max Payne and the strange horror vibes of Alan Wake. Control taps into that pedigree but changes the formula. Gone are corridors of baddies and highly choreographed encounters. Remedy wants Control to be unpredictable. Players are free to get lost in its world and encouraged to experiment with combat systems. Control tells the story of Jesse Faden. Appointed as the new head of the Federal Bureau of Control, Jesse’s tenure becomes complicated when a supernatural force wreaks havoc at the bureau’s headquarters. A strange force called the Hiss is tearing down the barriers between dimensions and hijacking people’s minds. It’s up to Jesse to solve the problem, a task that will involve using supernatural abilities like leaping back and forth between reality and the Astral Plane, a parallel dimension. “I am a bit nervous when it comes to this game,” Kasurinen said. “I think we’re jumping into being strange again compared to Quantum Break, where we were trying to appeal to everybody.” Remedy’s previous title was released in 2016 and published by Microsoft. The reception was mixed. 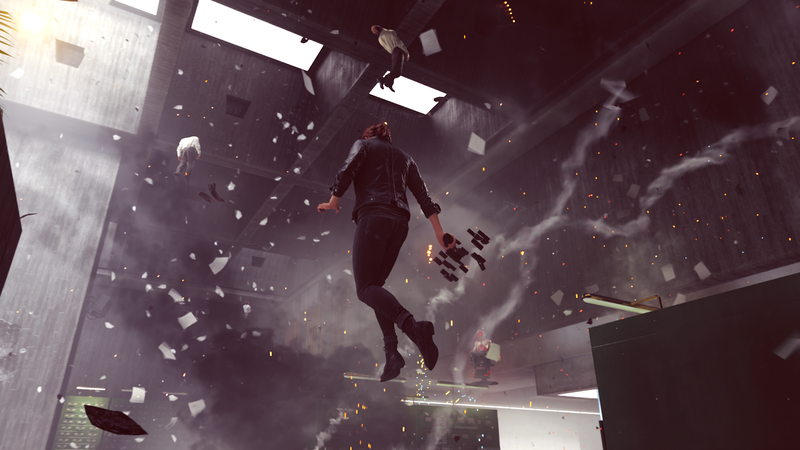 Control is meant to be a different kind of game for Remedy, an experiment in world design and narrative. A development team member demonstrated the game, guiding Jesse through the Oldest House, the Federal Bureau of Control’s headquarters. A massive brutalist monument, its halls were mostly composed of stark concrete and hard edges. Offices were adorned with technology that looked 50 years too old. Imagine Half-Life if it were set in some old Boston skyscraper. Jesse looked decidedly like an outsider, a young woman in halls clearly built by stodgy old men more interested in their mad science and theories than what might happen if they flipped a switch and opened a tear in reality. The main stairwell was massive, and as Jesse was guided up, she was beset by possessed Bureau members who rushed around with supernatural jerkiness. Thankfully, Jesse had a handful of tools to deal with anyone possessed by the Hiss. The first was her service pistol, a strange obsidian gun facsimile that transforms into various configurations. The default was a rapid-fire burst that needled enemies to death, but a button press could change it into a supercharged hand cannon that penetrated concrete barriers and ripped through bodies. It paired nicely with Jesse’s other tools: supernatural powers. Jesse could levitate through the air, use telekinesis to hurl chunks of concrete at foes or stop projectiles in their tracks, and even dominate the minds of weaker enemies to make them fight for her. Seeing it in action was hectic, but when I was later allowed free time to play around, I found the combat incredibly easy to understand. There was a sense that when you leaped into the air, the world still made some type of sense in spite of all the otherworldly magic. If someone fired a rocket at me, I casually snatched it out of the air. If enemies were hiding behind barriers, I levitated to the right position to fire a charged pistol burst. Was that strange Hiss orb buffing enemies? Oh, well that just meant I needed to turn its allegiance and make it buff my health pool instead. Where Remedy wants to set Control apart from other Remedy games is the approach to world exploration. Kasurinen was quick to mention games like Metroid and Dark Souls when discussing the Oldest House. The aim is to have it be a continuous world that players can explore, finding hidden secrets and using new abilities to overcome previously impassable obstacles. This could mean getting lost in a mirror maze in an abandoned research wing or leaping into the Astral Realm to traverse a distance before popping out somewhere else in the real world. Control has a main story, but the world is full of sidequests and secrets to encourage exploration. It’s a risk, but that’s the point. If Remedy wanted to embrace mystery and to stress exploration in Control, it meant accepting that players might get lost or miss exciting secrets. It means giving up control. In a slide presentation, Kasurinen used the word “layered” to describe the world design. It was a core pillar for the game’s direction, as was the notion of control itself. To keep things fresh as players explore, many of Control’s encounters are randomized. Kasurinen doesn’t always know what will happen next, and he’s the game’s director. Allowing for the possibility of chaos by moving away from a linear format gives Remedy space to explore gameplay in a different way from their norm. What I’ve seen so far has left me intrigued. Mixing Metroidvania sensibilities with frantic combat made for a fun time. Will I curse under my breath while I’m lost in a mirror maze, or maybe get worn out on brutalist concrete slabs? It’s possible, but I’m genuinely curious to see how Control shapes up. If anything else, Remedy’s quirkiness shines through in what little I saw. We’ll know if the experiment was a success or not when Control releases on Aug. 27.